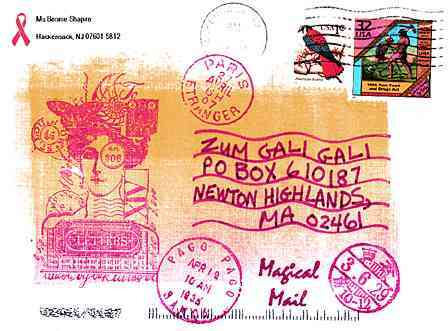 In days gone by, no self-respecting stamper would think of sending out a piece of snailmail without decorating it with a few stamped images (well, except for bill payments). 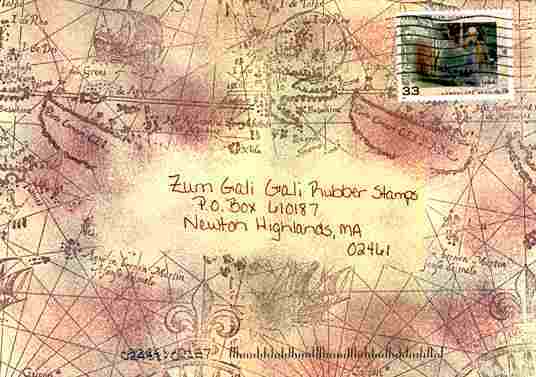 However, in the last several years we have received very few decorated envelopes. While the internet has made it easy for tiny businesses to reach customers all over the country, the increased use of email for ordering and the reduced need for printed catalogs has kept our post office box empty most of the time. I love seeing photos right away from friends on Facebook, but there's still something special about holding a piece of paper that you know someone else actually held, and that exists only in a few copies. It's just different from a bunch of electrons that's on any computer with the right passwords. We are regretfully admitting that we can no longer offer enough new images in a Web Envelope Gallery to make it exciting. 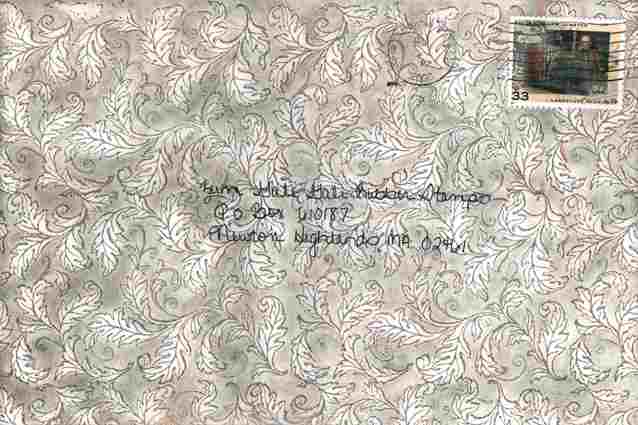 We've left up some of our old favorite envelopes, but we'll probably be adding new ones rarely. This was a special treat -- not only was the envelope decorated, but it was the folded "let your letter be its own envelope" project that's been on our website for years. Both sides were decorated. The back first -- I hated to cut the beautiful seal, but it didn't want to peel off neatly. The chicken and "I don't feel like working today" look eraser-carved! 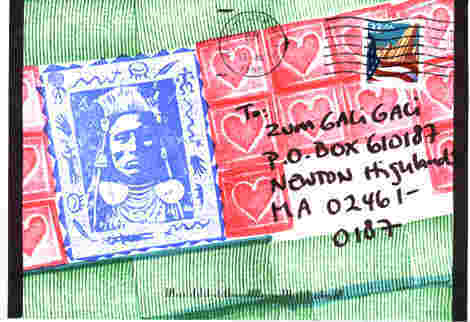 How about that postmark! 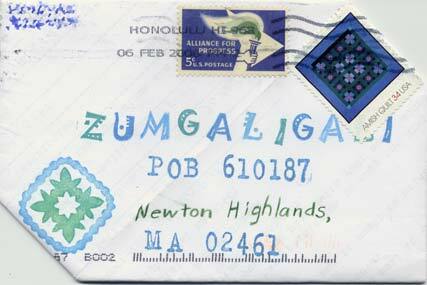 It's always nice to get mail from Hawaii, especially in February. 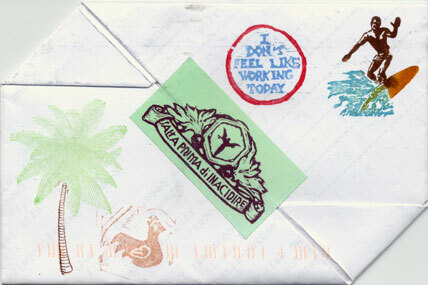 We always enjoy thinking that our stamps can go play someplace warm when we can't. Look how the colors coordinate with the postage stamps and the pineapple square stamp echos the quit postage stamp design. The blue and green make me think of ocean and tropical foliage. Thanks, Shannon VanDyke. 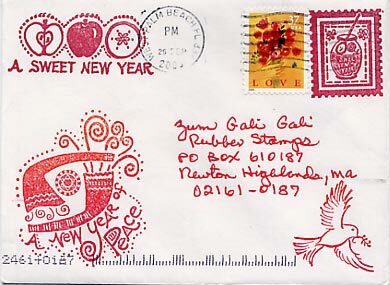 One of the few decorated envelopes we've received this year contained a Rosh HaShanah card from Sandy Cohen in Florida. She used three of our stamps and one that's not ours but which we like, and coordinated the stamp and address colors with the postage stamp. Bonnie Shapiro sent us this in June 2000. With the victorian picture it looks as though it comes from the century before last, and the wavy address reinforces the image of a long sea voyage from Pago Pago, or maybe somewhere in East Asia -- who would have guessed that the real postmark was Hackensack NJ? We hadn't looked at this page in a while, and when we did get two empty envelopes we were a little puzzled. These two, from Laura Haberjak of Elizabeth PA, were stamped and sponged so carefully and uniformly that at first we thought they were commercially printed. When we looked more closely, we could see that they had been done by hand. Hallmark would do well to have envelopes this beautiful! We also enjoyed the Fredrick Law Olmsted postage stamps on them. Olmsted designed much of the Boston park system and is remembered very fondly in this area. I've moved the older images off this page, but not off the site. Click on Gallery archives below if you want to see more.